Welcome to the North American Coton Association website. We hope to provide helpful and educational advice to all Coton owners, breeders and those considering a Coton puppy-addition to their family. If there is information that you need and do not find on our site, please let us know and we will do our best to accommodate you. On April 9, 2015, National Breed Club status was granted to the NACA by the United Kennel Club. 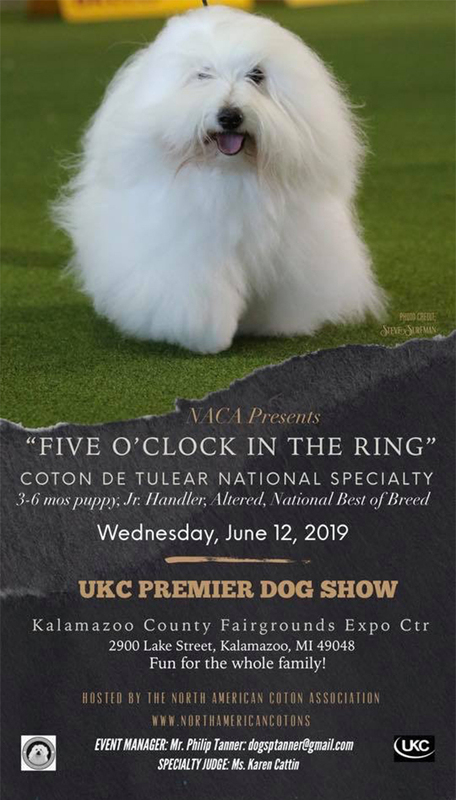 As the UKC's National Parent Breed Club for the Coton de Tulear, our Cotons are registered with the United Kennel Club, the largest all-breed performance-dog registry in the world. Established in 1898, the UKC registers dogs from all 50 states and 25 foreign countries. Operating under the auspices of the United Kennel Club, we subscribe to their Rules and Code of Ethics. We promote and participate in UKC conformation and performance events. Please visit the UKC website to learn more about this prestigious organization. Our 2019 Specialty is coming up. Join us! Entry information is available on the UKC Premiere Schedule.